Don't look now fans, but the venerable Dow Jones Industrial Average has fallen for six consecutive sessions. While, the S&P 500 has fared a bit better, and the small-cap indices are actually up during this time frame, many analysts seem to think that an all-out trade war and/or slowing global economic growth will surely put an end to the current bull cycle. Personally, I'm not so sure about this idea. So this morning, I'd like to share some charts that are keeping me fairly upbeat on the U.S. economic outlook, and in turn, the stock market. From a big-picture standpoint that is, and trade wars notwithstanding, of course. The data comes from the National Federation of Independent Business, better known as the NFIB. This organization is perhaps best known for its monthly look at small business activity and sentiment. Why am I looking at small business activity when the rest of the world is worried about 1929-style trade war? It's simple really. Small business is the backbone of the U.S. economy. And since most small businesses conduct commerce right here in the good ol' USofA, these companies really don't have too much concern about Trump's standoff with Beijing. For the record, this argument also explains why the Russell 2000 and the rest of the small-cap indices currently reside either at or near all-time highs and have been enjoying a very nice run of late. 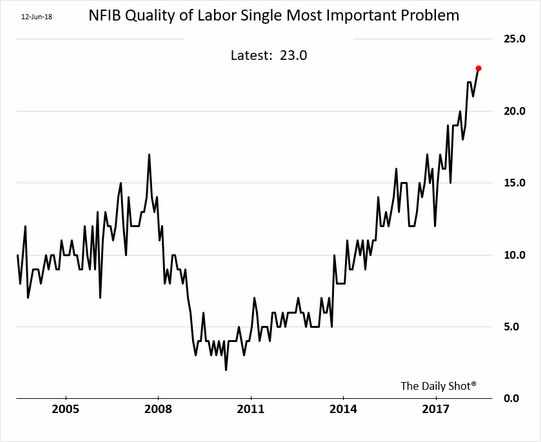 From my perch, the NFIB data tells a pretty interesting story here. So, let's take a look. 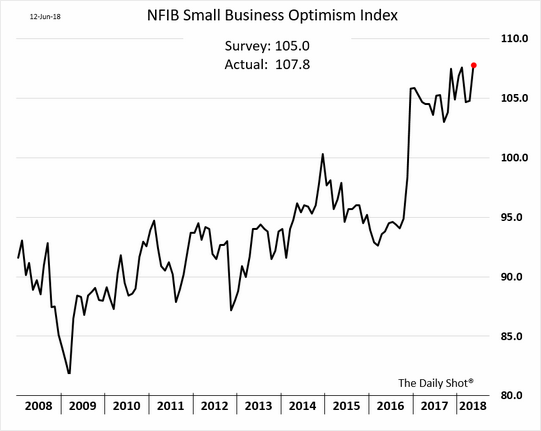 I'll start with the NFIB's flagship, the Small Business Optimism Index. As the name implies, this data set looks at how small business owners are "feeling" about the current environment. Hmmm... The latest index reading not only came in nearly 3 points above the survey estimate, but also at a new high for this cycle. As such, I think it is safe to assume that small business men and women are pretty darn optimistic about the future. 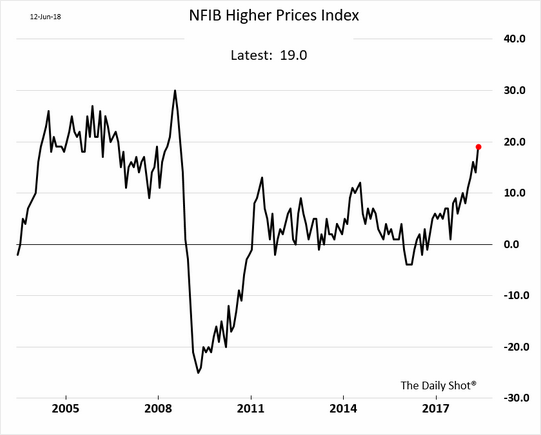 The Small Business Optimism Index increased in May to the second highest level in the NFIB survey's 45-year history. The index rose to 107.8, a three-point gain, with small businesses reporting high numbers in several key areas including compensation, profits, and sales trends. "Main Street optimism is on a stratospheric trajectory thanks to recent tax cuts and regulatory changes. 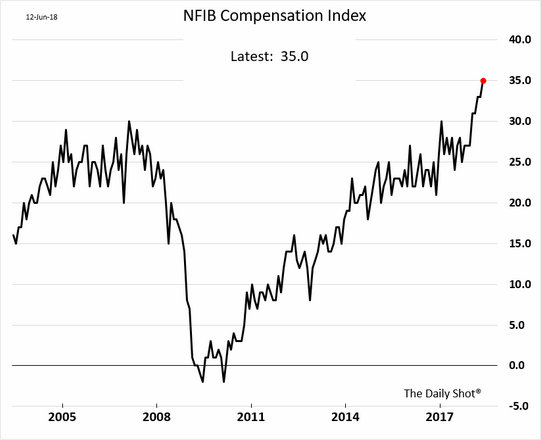 For years, owners have continuously signaled that when taxes and regulations ease, earnings and employee compensation increase," said NFIB President and CEO Juanita Duggan. 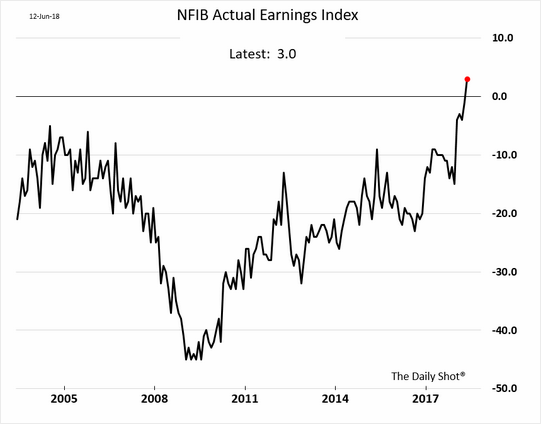 Next up is the NFIB Actual Earnings Index, which, again, as the name suggests, measures the earnings/profits of small businesses. Now that's an impressive chart. And yep, you guessed it; small business owners attributed the strong earnings increases seen this year to tax cuts. On that note, one of the knocks on the tax cuts is they will be temporary. So, I then turned to the category relating to future expansion. I think you might find this picture in the dictionary right next to the definition of the term "chart spike." In short, it looks like small business owners are looking to expand in a big way. 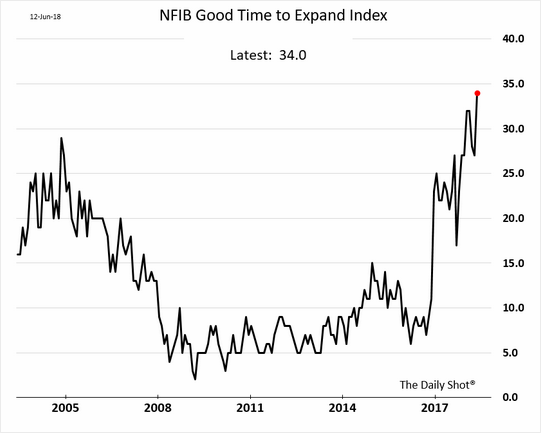 "Small business owners are continuing an 18-month streak of unprecedented optimism which is leading to more hiring and raising wages," said NFIB Chief Economist Bill Dunkelberg. "While they continue to face challenges in hiring qualified workers, they now have more resources to commit to attracting candidates." While I do agree that this has obvious inflation implications, it is also considered a sign of a strong economy. This chart makes the point clear that finding qualified employees is becoming a problem. According to the report, 58% of small business owners reported they were either hiring or trying to hire, which was up a percent from last month. However, 83% of the owners looking to hire reported "few or no qualified workers." If you know anything about what really drives inflation (and it's not oil), this last point should be concerning. However, to date, we are not seeing a trend of job-hopping for higher salaries or employees feeling like they are in a position of strength when it comes to compensation. But after reviewing the NFIB report, this remains something to keep an eye on. In sum, the most recent report on small business provides some pretty strong arguments that the economy is indeed strong - perhaps stronger than most economists realize. Perhaps even strong enough to withstand any stupidity involved with a trade war.